Arriving the week of the 20th May we have a new clothing brand arriving by the name of Good Life aka Glife. 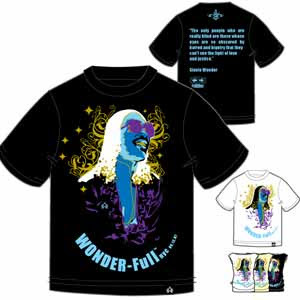 Above is a collaboration t-shirt they have just completed with Wonder-Full. Wonder-Full is a party dedicated and a tribute to Stevie Wonder. The above t-shirt is to be released at this years Brooklyn NYC event on May 12th and feature Dj Spinna and Bobbito. There is a Japanese version due for release but don’t think these will be hitting the UK but keep an eye out for Glife dropping in the UK and on The Urban Shop end May.